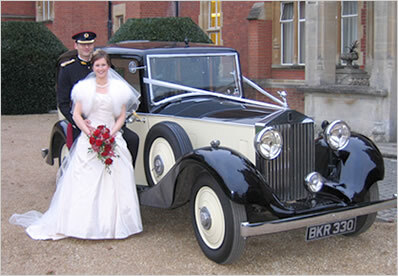 Angela is a beautiful vintage Rolls Royce Limousine; she is painted in ivory and black and is a very impressive car. She has a huge amount of rear space and can accommodate any style of dress. Getting in is easy with her rear hinged coach doors allowing you to walk straight ahead into the car. 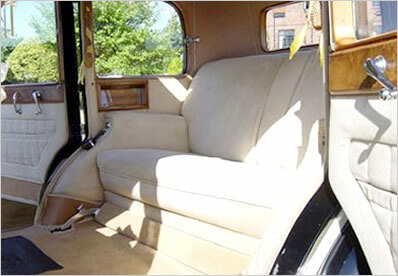 Her interior is in light beige and she has a walnut wood trim and all her original fitments, including occasional seats allowing her to carry up to 5 passengers in the rear. Angela is admired wherever she goes, and now can be offered as a matching pair with Emily. 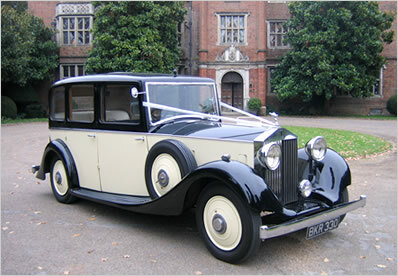 Angela is a 1934 Rolls Royce and her bodywork was built by Windovers. She was sold to Lady Plender, who owned her until 1969. She was then shipped to the USA and returned in the 1990’s. We purchased the car in 2000 and totally restored her to her present stunning condition.